Please enter mailing address under ‘Message’ Category. Keep in touch with the news of Annandale High School by subscribing to The A-Blast, one of the nation’s top ten student newspapers. The A-Blast offers 14 sections ranging from News and Sports to International and Academics. Through a business partnership with The Washington Post, The A-Blast is printed as a full broadsheet with color at the Post’s Springfield plant. 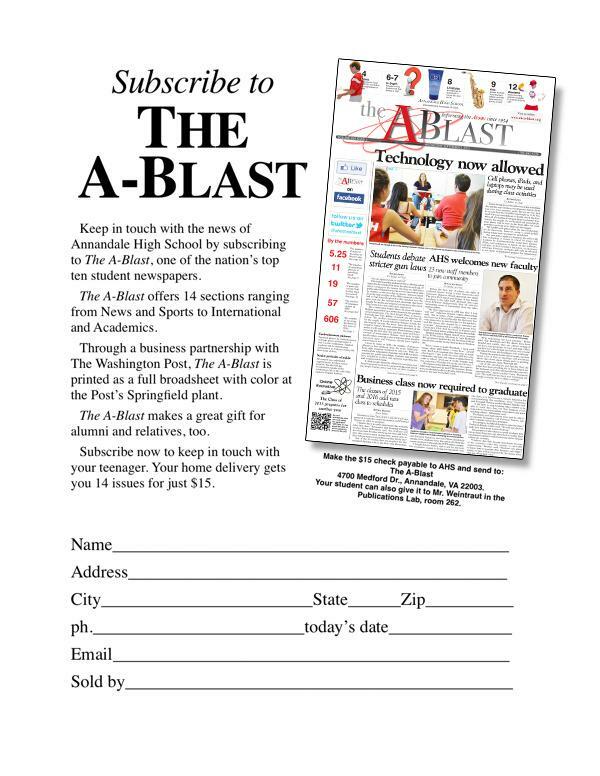 The A-Blast makes a great gift for alumni and relatives, too. Subscribe now to keep in touch with your teenager. Your home delivery gets you 14 issues for just $15.